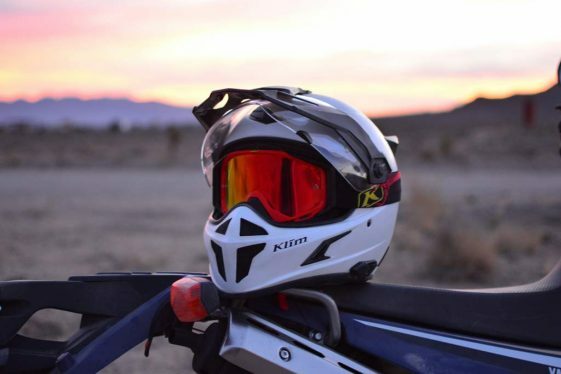  Klim's new high-end Adventure helmet strives to reach the pinnacle of ADV. 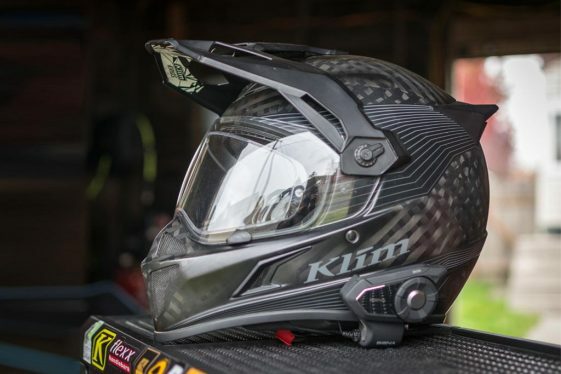 With a lightweight carbon-fiber shell, advanced features and the ability to adapt to various riding styles, the Klim Krios Adventure Helmet challenges the notion that one helmet can’t do it all. 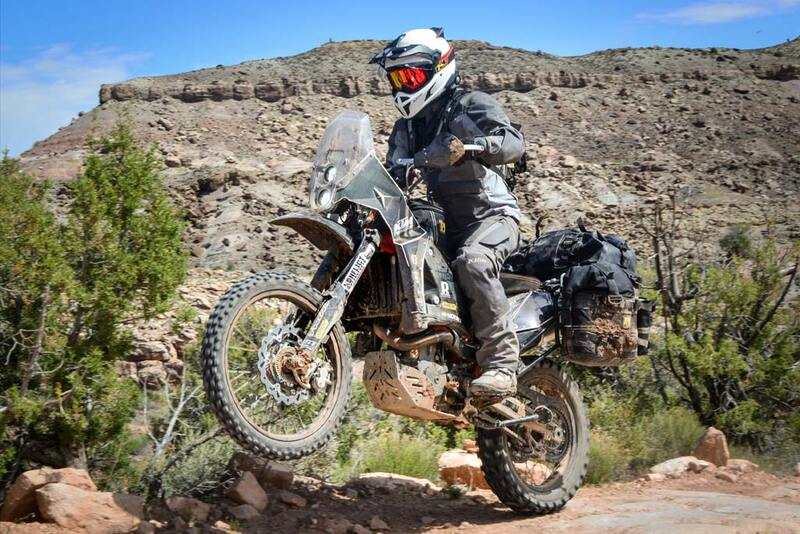 A mainstay in the adventure motorcycle community, Klim produces some of the most advanced riding gear available. They have brought to market iconic pieces such as the Badlands Adventure Suit that is now several generations into development. With this commitment to progress, it was no surprise when Klim recently began expanding their existing product lines and branching out to new markets. This new expansion brought us the Klim Krios, which quickly gained a solid footing in the high-end Adventure Helmet market. 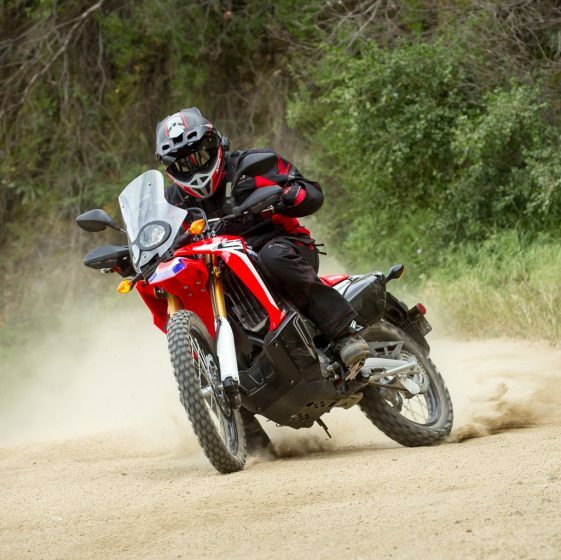 By focusing on the real-world demands of riders, Klim developed the Krios with versatility and comfort in mind. It features a hand-laid wide carbon weave shell, great acoustics and four configuration options: (ADV/Dirt/Trail/Street). An always open chin vent, open or closed forehead vent and four exhaust ports on the back of the helmet handle ventilation. The Krios offers four different configurations: ADV, Dirt, Trail & Street. Out of the box, you get two different Pinlock-ready shields (Clear and Smoke), a Pinlock lens and accessories to configure the helmet in its different ride “modes.” The Krios also has a two-way adjustable peak that can easily be tweaked on the fly to accommodate different riding styles or the location of the sun. By producing a helmet weighing in at a mere 3¼ pounds (Size Large) that meets both DOT and ECE standards and can hold its own both in the dirt and on the street, Klim strives to reach the “Pinnacle of ADV” with the Krios. The first time I picked up a Krios helmet at Klim headquarters in Rigby, Idaho, it was so light that I thought it was a 3D printed sample. Riding with the Krios, its lightweight shell made a noticeable difference and neck fatigue was cut down significantly. Wind noise was also less of a factor thanks to well thought out aerodynamics. The Krios became my go-to helmet over the last year logging some 10,000 miles. On road it is quiet with a great field of vision and I experienced very little buffering on the highway. Off-road its lightness shines and the big eye port fit even the largest framed goggles (Radius Pro we’re looking at you!). Ventilation was one thing I felt was lacking off-road. The seemingly large chin vent on the Krios actually directs air up to the windscreen instead of directly to the mouth area. Unless the windscreen was removed or in the fully open position, the interior would get pretty stuffy during strenuous riding conditions. I also noticed the windscreen does not fully retract out of view. About an inch of the lower portion of the screen remains in view when riding with goggles, taking away some of the helmet’s generous field of vision. During testing, I used several different SENA Bluetooth units that all fit well on the Krios. The quiet interior made for two-way communication void of wind noise and the ability to listen to music at lower volumes. The helmet is also specifically designed to integrate with the SENA 10U, which offers a flush-mount fit. Despite the quarter-turn quick releases for the windscreen, changing configurations on the Krios was a little less intuitive than you might expect. It took some practice getting the holes lined up when re-installing the windscreen and peak. 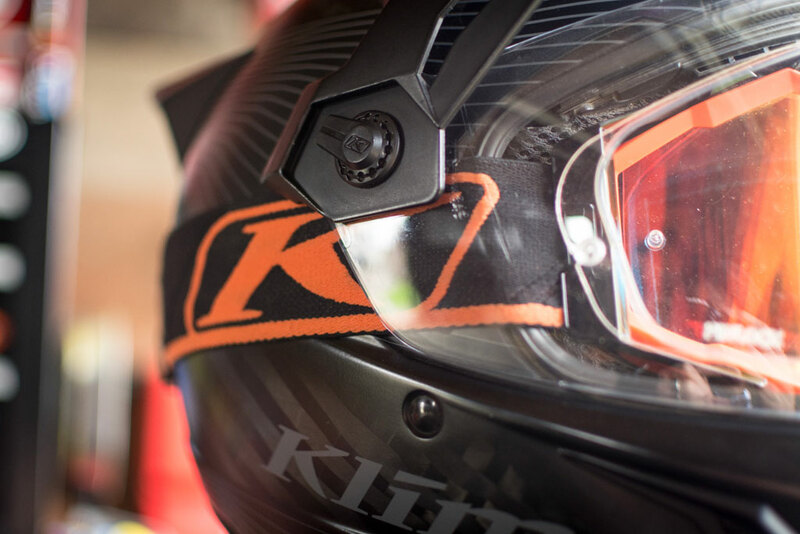 The Krios lets you smoothly close the windscreen over a goggle strap without bunching it up. The Krios held up well to my long-term testing with the interior feeling just as plush today as it did twelve months ago and no failed parts. It still cleans up nicely even after all the off-road abuse making it a great every-day helmet. From desert terrain in Death Valley to the high peaks of the North Cascades, the Krios always impressed with its functionality and lightness. The Krios is for riders that want a do-it-all helmet without too much compromise. It shines as an everyday dual sport lid or on trips where surface conditions are constantly changing. While certainly in the premium helmet price bracket, it still represents a good value at $550. Klim also offers a variety of different graphic color options for the Krios. The Klim Krios is a great ADV lid, not perfect but an impressive first offering. Weighing in a full pound lighter than some of its direct competitors, the Krios pushes the envelope for this segment. 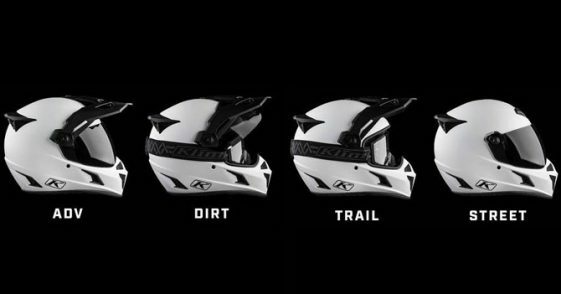 Klim deserves credit for bringing to market one of the lightest, quietest and most comfortable adventure helmets, but compromise is unavoidable in an ADV Helmet because of all the different things we ask them to do. Lack of airflow in the chin vent is one area they may have compromised too much in an effort to make the helmet quieter. Although considering what they’ve accomplished on their first try, you can expect the next version of this helmet to be lights out. Its light weight really helped cut down on fatigue. We found the Krios to be very quiet for a dual sport helmet. Great field of vision with little to no distortion in the windscreen. Includes Pinlock insert and two screen options (clear and smoke). Plush interior with fast-wicking, anti-microbial liner. Goggle-friendly design with ability to close screen over straps. Ventilation didn’t move enough air in warmer climates. Would like to see a quick-release cheek pad system in future. Changing configuration was more difficult than expected. I had been considering one of these, even though I really dislike spending more than $200 on a helmet. But after reading this review, I will have to pass. Here in Arizona, it’s vitally important to have a helmet with excellent ventilation, since our Summers are quite warm. Interesting, ever consider that it’s better to sweat, than bleed? I have to side with RobG on this one. I’m in Tucson AZ, and the imperative is ventilation. There are many fine ADV helmets that are available with good to excellent vent systems. Over the years, I’ve noticed something that is intuitive: Quiet = Stuffy. Noisy = Well Vented. It seems you can not have both. However, I have yet to wear a Schuberth, and so it may be both. For a Price. But, not $200. Double D rings? Some other chin strap release? No adjustable cheek pads, eh? The beak is long, so I’m thinking there’s room for a boom mic in front of the mouth, yes? Ear pockets big enough for the Sena speakers, yes? On your ride (the AT, it appears), where did the wind hit the helmet? Or, did it go over the top of the helmet? (This points at an apparent noise reduction that you do not mention). Thanks. Yes, double “d” ring chin strap. Yes, plenty of room for a boom or wired mic and the helmet was designed to work with Sena speakers so they fit smartly. I tested this helmet on a plethora of different bikes and it performed well in clean air and behind a windscreen. The AT windscreen the came up to about my eyes worked especially well. Thank You! I have turned down numerous helmets for non-D ring fixtures. The micro clips types tend to strangle me when I drop my chin. So, I buy D Ring only type straps. I’m currently in a Shoei X2, which meets all the criteria I’ve asked about. At $550., this Klim offering is direct competition to it. Is there a chin curtain? I’ve used goggles for off road work here in the desert, what a PITA they are. Another piece of kit to put on / take off with every stop. I’m not racing, so now I just stay back far enough to keep out of the dust rooster tail. Or, I ride alongside of my mate, at their 4 or 8 oclock position (I’m visible in their rearview mirror). Dust problem solved! No goggles… Anyway, the Klim is a nice offering and I will look closely at it, but they’re playing a “catch up” game in a well established carbon fiber market. The lack of venting is somewhat a deal breaker for me. Arizona is tough! I rode the AZBDR last year in this helmet and it was OK in the heat but I was always using goggles with the face shield fully open. I missed an opportunity to ride the AZBDR in 2017. I hope to amend that in the next year. I read your ride report, what fun you had! I’ll bet that’s all you remember now, is the great time. The struggle spots has faded to background, eh? Some of it has burned since you went through. FR300 (Rim Road) is blackened in some areas around Payson. Excellent review and I agree with all of your listed pros and cons of this helmet. I love many of the Krios features and just had to have one. I tried it on a couple of times and bought the helmet in a small. Of special note for small riders, the smallest shell is labeled SM and that means it is the smallest produced. It does not however fit a small physique. I wear the Arai XD4 and the Arai RXQ which both, luckily come in an XS. Also, the Krios pads are offered in only one size. Arai offers padding in 3 different sizes so you can better customize the fit. So, pin heads beware! The length of the helmet below the chin also seems a little long so it is uncomfortable to look down or drop your chin to block the sun. Great feedback and information, thanks!